Last night, Skip and I led our 2015 confirmation class in a rehearsal for the service this Sunday. We have six confirmands this year—young men and women who have impressed me time and again with their thoughtfulness, kindness, and dedication to this endeavor. They come to church for class on Sunday nights for two years in order to learn, question, and grow their faith and the promises made for them at their baptism. It’s a serious commitment, for a serious act. During rehearsal, we were going over one of the more important parts of the service: the Apostle’s Creed. We ask that they all memorize the Creed. I remember when I was at my own confirmation rehearsal, and I was terrified of making a mistake in front of the whole congregation. Luckily for our confirmands, they say the Creed with the whole congregation (and they’re going to be facing the altar, so any mistakes will go unnoticed). As we were practicing, I managed to flub a few words—the consequences of having memorized several different translations! I told the ninth-graders that if I messed up a little, they were clearly allowed to, as well. But it made me think a little bit more about the Creed. It’s one of those things that I’ve been able to do from rote since my own confirmation, and as such it’s one of those things that I’ve stopped carefully considering every time I say it. If it’s ok for me (or the confirmands) to get a few words wrong, clearly the power of the Creed doesn’t lie in the specific words used. It’s so much more than words and memorization. It’s a statement of faith, and as such, has to come from a deeper place than just my brain. I once read in a biography of C. S. Lewis that, when he was joining the Anglican Church, he wasn’t sure he would be able to honestly recite the Creed. Intellectually, he rebelled against some of the statements in it but still wanted to join the church. The priest had a simple solution: he didn’t have to say the Creed, but he was welcome to sing the Creed instead. Lewis thought that this was something he could do without feeling hypocritical. Singing (and poetry) has a way of digging into that deeper place, getting past facts and into truths. And when we get to the heart of matter–for Lewis, for me, or for the confirmands—it’s about the truth that the Creed gives us. That we are created, redeemed, and made holy by the very God that calls us to our profession of faith. In confirmation, we repeat the promises made at a baptism: to live among God’s faithful people, to hear the word of God and share in the Lord’s supper, to proclaim the good news of God in Christ through word and deed, to serve all people, following the example of Jesus, and to strive for justice and peace in all the earth. But, and (in my opinion) more importantly, we also repeat the promise that they are a child of God, who will never lose the love and comfort that this entails. The Creed is an important part of this service, not because it is some type of test of what we believe, but because it is a full-bodied celebration of the fact that we are God’s, and we know that truth deep in our core. This past Sunday was that all-holy festival of the liturgical year: Mother’s Day. We recognized it at St. Paul’s with a welcome for mothers, and special prayers for those who provide mothering care. It’s always a bit of a touchy Sunday for me. I’ll never forget the time I learned of a friend who recently had a miscarriage, only to be asked in church on Mother’s Day why she was waiting to start a family. Or knowing that friends of mine have struggled with fertility, and desperately want to be mothers. Or don’t want children at all. Or the person whose mother has recently died. I think celebrating the way in which a mother’s love can be used to nurture and care is wonderful. I think that lifting up women who deserve recognition, and may rarely get it is, is an important thing to do. But I do think in the church, we have a delicate balance to strike, considering those present have such a wide range of experiences. BUT, it did get me thinking about the many ways we can talk about God. We frequently talk about God as Father, but what about God as Mother? What about the ways in which God resembles a mother’s care? Jesus compares himself to a mother hen, saying, “How often I have longed to gather your children together, as a hen gathers her chicks under her wings” (Matthew 23:37). If Jesus is willing to use feminine imagery for God, why do we so rarely do so? Julian’s imagery broadens my understanding of God. Personally, I don’t view God as either male or female, but as containing attributes that are not necessarily gendered. God is bigger than our human understanding of male and female, so I try not to limit myself to one set of pronouns or attributes. When I imagined God as a child, I frequently imagined a king, or alternately a shepherd. Now I have a wider range of images and words, but I tend not to have as clear-cut a picture as when I was little. I know that means my thoughts about God have become more nuanced, but in some ways I miss how clear cut things used to be. What about you? When you imagine God, describe God, what words do you use? What images come to mind? Has it changed over time? Please feel free to share in the comments, or let me know what you think about God as mother. Last week, I had what has turned into a fairly frequent conversation for me. At my dentist, the hygienist asked me what I did. My response, that I was a pastor, generally gets one of two reactions: discomfort and a swift end to the conversation, or pleasure and congratulations for me. At my dentist’s office, it was the latter. “How wonderful that you have a calling!” she exclaimed. Since her hands were in my mouth at the time, I could only nod. And it is wonderful, I thought, but I really wanted to ask her if she found wonder in her calling. If she saw her work as part of what God intended for her to do. Because I did. We all need dental hygienists, after all. And she was great at her job. I’ve always, always, had a fear of the dentist. My heartbeat starts to race just pulling into the parking lot. And this woman greeted me with a reassuring smile, explained everything she was doing, and generally managed to put me at ease. What a gift! She didn’t have to go out of her way to help me stay calm, but I believe she truly cares about her patients and takes pride in her work. In my eyes, that’s having a calling. But from the way she responded to me, I got the sense that she didn’t really see her work as calling—or at least not a calling from God. She wouldn’t be alone. There’s an odd phenomenon of a sort of scale and measuring of occupations—some get the moniker “callings,” while others are mere “jobs”. And I think we’re doing a disservice to ourselves. 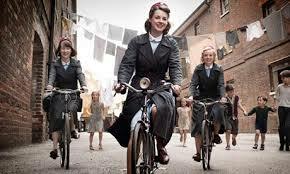 The best presentation of calling I’ve come across lately has been in PBS’s show Call the Midwife. It’s another British import, set in 1950s London. It focuses on the lives and work of a convent of nuns and the lay nurses who live them. Trained as midwives, these women serve Poplar, one of the poorer communities in London. Madness, or perhaps a call. As the show continues, it offers many insights into just how tricky discerning a calling can be. There’s the nun who decides to leave the order and marry the widowed doctor. “Sister Bernadette has been given a new calling, to be a wife and mother,” the head sister explains. The idea that the sister no longer has a calling because she is leaving the order is never entertained. God has called her to different work, but no less honorable or faith-driven work. Perhaps the most heartache inducing is the nun who feels she has no work left. Sister Monica Joan, an 80-year-old, became a midwife in the close of the nineteenth century, leaving behind the comforts of an aristocratic family. But now, in the 1950s, she is unable to nurse any longer. Her mental capacities are declining, and she feels useless. The sisters and nurses try to give her knitting projects and busywork, but above all else she desires to feel like she is needed, and as if she is still serving a purpose for the community and for God. This show gets it. It celebrates the religious calling of the nuns, but it also celebrates the way that God is acting in this community through the work of nurses, doctors, handymen, mothers, scout leaders, and the whole colorful cast of characters. I’m not sure how much of this I would have told my hygienist had I been able to talk. But it is my hope that she, and each of us, sees how important our work is, whatever it is, and how we can honor God’s purpose by doing it with care and dedication.